Don't faint, but I am blogging three days in a row! I have neglected this site a bit in the last several months, blogging very sporadically. But today I want to share about the #selvageblockalong I started on Instagram and how I am progressing on this project. I hope more people will join in. I have also started a Flickr group. So far I have made 64 blocks. Thanks to my friend, Coutenay, I have plenty of selvages. Today, I needed a diversion, so I made a clutch, using selvages. It's a simple pattern, available in my Craftsy shop. See the link in the sidebar of this post. I lined it with the strawberry print from Briar Rose. Only 36 more blocks to go and I will have the 100 I am aiming for. I need to make 2 gifts for the Handmade Birthday Club. I haven't even started thinking about the things I need to make and organize for Sew South. Plus I signed up for Secret Sister, for Sew South, and need to make something for my secret sister. I think the selvage blocks are going on the back burner for a few weeks. Thanks for stopping by and sticking with me and my sketchy blogging schedule. Love your clutch with your Posy quilt in the background. 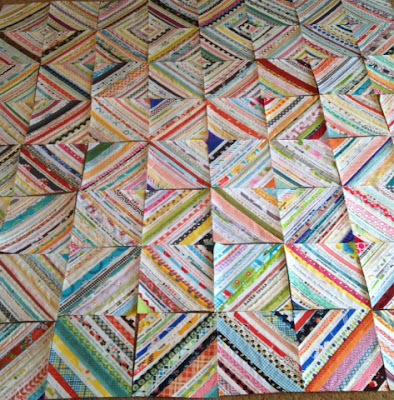 That quilt is going to be an amazing finish. I cannot believe how quickly you are churning out the blocks. And the clutch is divine. You do make beautiful things! I've collected selvages for - forever - and have done nothing with them yet. You've made quite a dent in your goal. Love the clutch. Love the clutch and your blocks look great! When I needed them I had none now I have a big bag full and need to make something myself! Happy travels! The clutch looks lovely in selvedges. You are a dynamo at getting things done! Wowza! Both your quilt blocks AND your clutch are amazing. So beautiful! Beautiful, beautiful, beautiful, love them, I can't believe you have made so many of the blocks, they look like they would take forever! 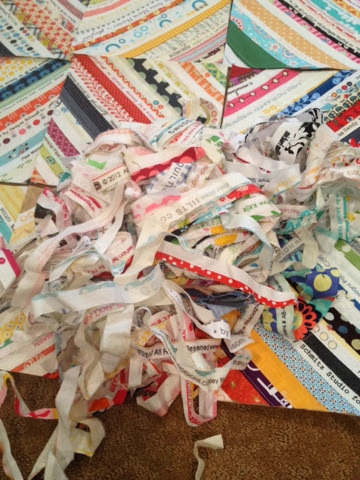 Your selvage quilt is going to be amazing. You have a lovely but long list there, I think it will be fun to get it done. That quilt is gonna be awesome. And love the clutch. Love your clutch, I am saving my selvages and will make something soon. At Road2Ca two years ago I saw on display an a-line skirt made out of salvages. I know, it falls into the much maligned "wearable art" category--but I've been collecting salvages since with that idea rolling around in the back of my head.